Joel Fitzgerald is a talented surfer/shaper from Australia. Being the child of '70s superstar Terry Fitzgerald certainly didn't hurt Joel's odds of becoming a surfing and shaping prodigy. We spoke with him about his life of surfing and shaping. I was fortunate to grow up in a surfing family. Dad shaped us boards and took us surfing from a very early age. I had the opportunity to travel with him to Tahiti, Japan, Indonesia and California all by the age 13.This was my journey that became my life surfing and traveling with my brothers and family and still is to this day. When did you get your first surfboard? Age 11. It was a 5’7 single fin with Spiderman on the bottom. It was also under the Christmas tree. Best present I have ever had. Slept with it that night. What was the feeling you had when you first stood on a board? Stoke, fun, and joy. It was just a total blast. Who did you look up to and admire when you were a child? My Dad, Tom Carroll, Poto, and my brother Kye. What Inspired you to begin shaping? I was searching for my purpose in life, and that's when I started shaping. What boards are you currently excited about making? I am so inspired by what is out there right now, its like how good is your imagination and this is where surfboard design is going right now. Asymmetric, quad fin twin fins, no fins, some new channel quads, low rails hard edge snub nose, narrow rather than wide, single concaves doubles, straight outlines, faster shorter lighter stronger glassing. New fin designs stringerless blanks. Hand shaped, roughed out, surfed and start all over again. Its about finding what works for you and enjoying the creativity of making something totally different than what’s out there right now. What do you want the rider of one of your boards to feel? I want him or her to feel enjoyment from the speed of the board. Speed is something that makes you go "Wow." Of all the places you have traveled to what place in particular stands out, and why? Indonesia. There are so many good lefts. It's like eat, sleep. surf, and get in touch with your body, spirit, and nature, explore and find new surf locations, make new friends, and test your surfing and surfboards, and eat a lot of pancakes. My wife Chrystal is amazing and inspiring and most people in our life right now are here to inspire us with new ways of thinking. Your imagination is also your greatest inspiration. What is the greatest thing you have learned in your life? Whatever you believe in will ultimately happen. Your imagination is your greatest friend. Don’t ever stop believing in great things for your life..
Surfing and shaping my own surf boards. Having a healthy life with my loving wife. Traveling and surfing and learning to stay healthy by doing Yoga and looking after my body, being apart of projects that give back to communities. What brings you the most happiness in the world? I love surfing with my wife Chrystal and sharing waves together. 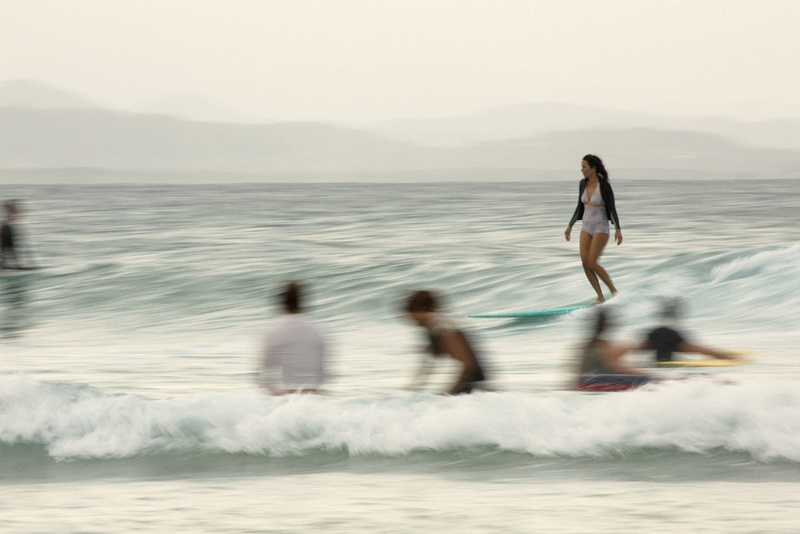 Who are some of the people you feel are shaping the path for surfing today? Ryan Burch is surfing better than anyone I have seen on his own asymmetric boards. Dave Howell from Misfit is creating some radical designs with Otis Carey. Hayden Shapes are looking really fun and Derek Hynd finless boards are tripping people out. Rob Monty is making cool Paipo boards and timber boards. All these people are shaping the path along with so many others like Rich Pavel, Bob McTavish, Terry Fitz and the little guy over the back fence. A few I didn’t mention: Thomas Bexton, Dane Peto Peterson, Alex Knost, and Ellis Ericson. What’s your favorite board? Favorite surf spot? Being alive and living the life I dreamed. To learn more about Joel Fitzgerald and his boards, click here. Photo credits: Photos of Joel surfing, quiver, and walking by Chrystal Fitzgerald, shaping photo by Chris Prestige, photo of Chrystal Fitzgerald by Nathan Oldfield, photo of Joel and Chrystal by Carly Brown.